Having lived in their new home for several years, these inspired homeowners were ready to finish their basement and transform it into a multi-zone space where they could mix and mingle with family and friends. Following several months of collaborative planning and construction, we delivered an envy-worth basement. With clean lines and neutral tones, the lower level’s style can be described as well-dressed rustic, and despite being a lower level, the space is flooded with natural light, making it anything but basement-y. Before the remodel, the basement was a wide open unfinished space. What’s great about the space is that it’s a large walkout, and unlike many basements, the utilities were already located away from the windows in what would become a storage room. The homeowners were hoping the space would eventually be a place where they could hosts guests to watch football, serve great drinks and have a place for their game table. With that in mind, the space was designed to have three distinct zones – a theater zone, a bar zone and a game zone – plus a bathroom. Central to the space is the bar/entertainment area. And while we call it a bar, it’s more like a mini-kitchen with ample storage, a beverage fridge, ice maker, microwave and dishwasher. Everything you need to mix and serve great drinks is conveniently located. With seating for five at the island, friends can easily keep tabs on the game on one of four TVs, or cheer on ping-pong players. While the theater and bar areas have plenty of seating, the homeowners also wanted to have flexible seating near the fireplace. The table shown can be expanded away from the wall to seat 4-6 people. When not in use, the table looks great against the wall as a sideboard. Having a fireplace in the center of the basement provides another heat source as well as cozy ambiance. Considered the goal that started it all … the homeowners wanted a theater area perfect for fantasy football fanatics and game day watch parties. With plenty of comfy seating and three screens, who would ever leave this viewing paradise? TV components are carefully arranged in a closet to avoid cords and clutter and a raised platform allows people in the back row to see well. 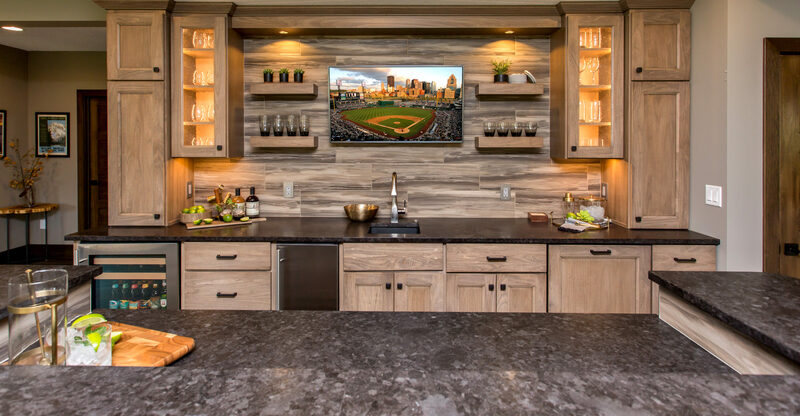 Guests to this home can take a break from watching the game to play a game! This wide open area has plenty of room for game tables and will be home to at least one old-school arcade game. A comfortable bench provides more seating near the window. No basement is complete without a bathroom, and this basement had room for a roomy 3/4 bath. The neutral theme is continued with repose gray maple cabinets topped with a Cambria quartz Galloway countertop that adds a bit of sparkle to the space. To see even more of this great transformation, visit our Facebook page. When you’re ready to transform your space, on any level of your home, schedule a free consultation with our team or sign up for one of our remodeling seminars.